Did you know that Jen Ruggles loves to dance? It is therefore natural that she loves to go to the Obon Dance Festivals and reconnect with friends and continue meeting our diverse District 5 constituents. Within our Council District, Keaau, Kurtistown, and Pahoa are host to some of these colorful and lively events island wide. The Bon (or more formally, Obon) Dances occur almost every weekend from June through September, on the Big Island and throughout the state. Cochin lanterns strung from the yagura. 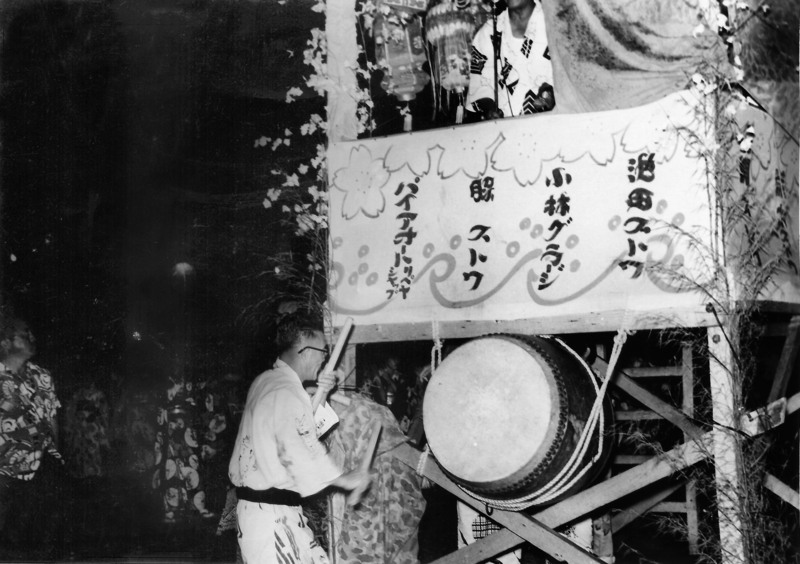 Taiko drummer at an early Obon festival. Obon is a Buddhist custom that originated more than 500 years ago in Japan and came to Hawaii in 1910 with the Japanese immigrant workers. Obon season is celebrated as a time to remember departed loved ones and our ancestors. These Bon festivals are very family-oriented; and often attended by three or even four generations within some families. These two-night festivals originates from the story of a disciple of Buddha who used his powers to look upon his deceased mother. He discovered she had fallen into the Realm of Hungry Ghosts and was suffering. He went to the Buddha and asked how he could release his mother from this realm, and was instructed to make offerings to Buddhist monks. The disciple did this and saw his mother’s release. This disciple also saw the true nature of her past unselfishness and the many sacrifices that she had made for him. Happy because of his mother’s release and grateful for his mother’s kindness, he danced with joy. 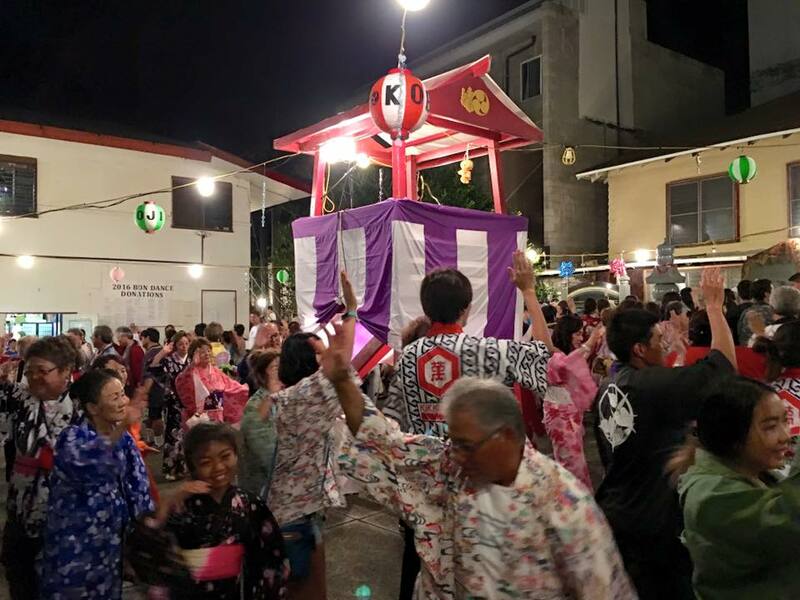 From this dance comes Bon Odori or “Bon Dance”, a time in which deceased friends and family ancestors and their sacrifices are remembered and appreciated. It is also the time of the year when the spirits return to visit their families in the world of the living. The season is marked by colorful chöchin paper lanterns and taiko drum troupes accenting the lively music and entertaining the crowds. You don’t have to be a neighborhood resident or Japanese or Buddhist to have a good time. Festival participants are welcome to join in the circle and dance around the yagura (tower). Just look for someone who is familiar with the dance, mirror their movements and have a great time. Common elements from one temple to the next are tasty local foods, the music and the dance. Beyond that, the commemorations vary from one location to the next. Admittance is free, but you’ll want to bring some cash (not credit cards) because these events are fund raisers for the various organizations that host them – and you’re going to want to buy some andagi (Okinawan doughnuts) and other tasty treats. Enjoy the rest of the Obon season this year and every year. Dancers of all ages joyously circle the yagura.